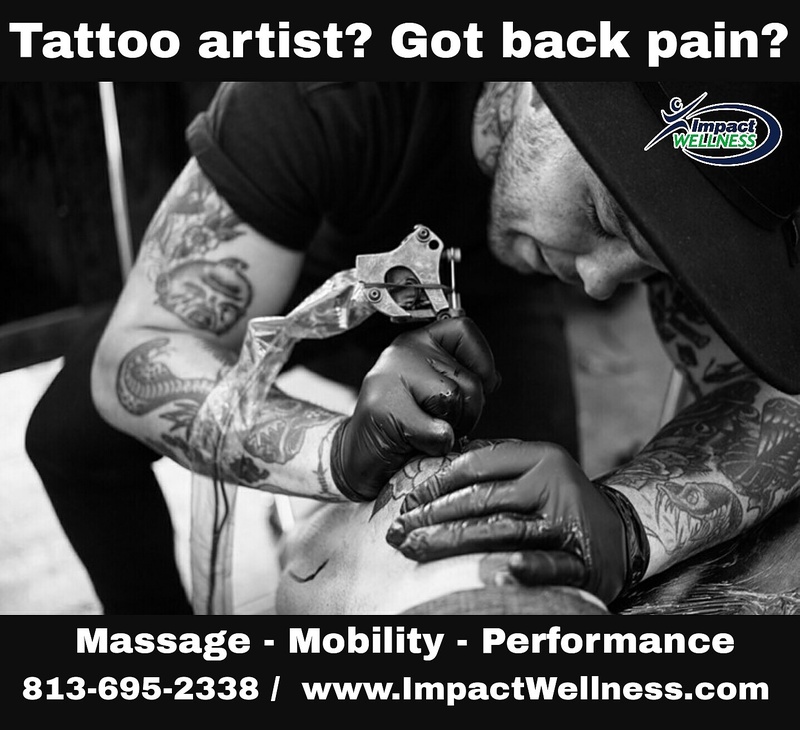 Posted on August 9, 2017	by Impact Wellness Inc.
Getting a tattoo may hurt, but giving one is no picnic, either.That’s the finding of the first study ever to directly measure the physical stresses that lead to aches and pains in tattoo artists—workers who support a multibillion-dollar American industry, but who often don’t have access to workers’ compensation if they get injured. Researchers at The Ohio State University measured the muscle exertions of 10 central Ohio tattoo artists while they were working, and found that all of them exceeded maximums recommended to avoid injury, especially in the muscles of their upper back and neck. In the journal Applied Ergonomics, the researchers presented their findings and offered some suggestions on how tattoo artists can avoid injury. The study was unique, explained Carolyn Sommerich, director of the Engineering Laboratory for Human Factors/Ergonomics/Safety at Ohio State. She and former master’s student Dana Keester spent a summer “hanging out in tattoo parlors with our EMG equipment, cameras and a tripod,” observing artists who agreed to work while wearing electrodes that precisely measured their muscle activity. To the researchers’ knowledge, this is the first time that anyone has gathered such data from tattoo artists at work.The electrodes gathered data for 15 seconds every 3 minutes for the entirety of each tattoo session. Though a single tattoo session can last as long as 8 hours depending on the size and complexity of the tattoo, the sessions used in the study lasted anywhere from 1 to 3 hours. In addition, the researchers used a standardized observational assessment tool to assess each artist’s posture every five minutes and took a picture to document each observation. To Keester, some reasons for the artists’ discomfort were immediately obvious. She noted that they sit for prolonged periods of time, often taking a posture just like the one immortalized in Norman Rockwell’s painting “Tattoo Artist”—they perch on low stools, lean forward, and crane their neck to keep their eyes close to the tattoo they’re creating. All 10 tattoo artists exceeded recommended exertion limits in at least one muscle group. Most notable was the strain on their trapezius muscles—upper back muscles that connect the shoulder blades to either side of the neck, a common site for neck/shoulder pain. Some exceeded limits by as much as 25 percent, putting them at high risk for injury. Those findings mesh well with a prior survey of tattoo artists that Keester carried out at the Hell City Tattoo Festival in Columbus, Ohio, in 2014. Among the 34 artists surveyed, the most common complaints were back pain (94 percent), headache (88 percent), neck pain (85 percent) and eye pain (74 percent). Tattoo artists suffer ailments similar to those experienced by dentists and dental hygienists, the researchers concluded. Like dental workers, tattoo artists perform detailed work with their hands while leaning over clients. But, unlike dental workers, tattoo artists in the United States lack a national organization that sets ergonomic guidelines for avoiding injury. One of the main problems is that the industry doesn’t have specialized seating to support both the artist and the client, said Sommerich. “There’s no such thing as an official ‘tattoo chair,’ so artists adapt dental chairs or massage tables to make a client comfortable, and then they hunch over the client to create the tattoo,” Sommerich said. Adding to the problem is the fact that many tattoo artists are independent contractors who rent studio space from shop owners, so they’re not covered by workers’ compensation if they get hurt on the job, Keester said. Despite these challenges, the Ohio State researchers came up with some suggestions that may help artists avoid injury. Artists could experiment with different kinds of chairs for themselves, and try to support their back and arms. They could change positions while they work, take more frequent breaks and use a mounted magnifying glass to see their work instead of leaning in. They can also consider asking the client to move into a position that is comfortable for both the client and the tattoo artist, Sommerich added. In the United States, tattooing is a $2.3 billion industry. A 2016 Harris Poll found that a third of Americans have at least one tattoo, and an IBIS World report estimated that the industry is growing at around 13 percent per year. This entry was posted in Health & Wellness and tagged artist, back pain, Impact Wellness, ink, massage, Massage therapy, neck pain, pain relief, posture, tampa, tattoos. Bookmark the permalink.